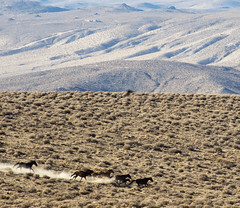 The Wild Horse & Burro Program has very few management options. 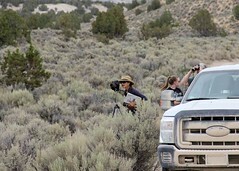 Legislation tells it what and how to manage with many wild horse advocacy groups watching and holding them to a strict interpretation and bringing lawsuits at the drop of a hat preventing proper management of the free-roaming horses. Businesses, state agencies, wildlife organizations, environmental groups and others put pressure on the Program to do the needed management. And to top it all off a rider on their limited funding prevents them from selling excess horses. With excess horses taking over half of the budget there is not enough left for the proper management of the horses. These videos are produced to show the Wild Horse & Burro Program doing a good job of managing the wild horses. The information presented in them is still far more accurate than almost all that is presented by wild horse advocates who find it impossible to separate myth from reality.